There are few more rewarding activities in your garden than growing your own vegetables. Not only do you get the pleasure of nurturing them and watching them grow, you also get to enjoy the fruits of your labour for dinner! Of course, that is not to say that you don’t have to put in any effort, but with a bit of preplanning and thought, everybody should be able to create at least a small patch for themselves. Ideally, you should be looking for the types of vegetables that give you a continuing harvest so that you can enjoy fresh vegetables for weeks on end. So, in this blog post, we are going to be talking you through some of the basics involved in completing this activity successfully. Like any other aspect of gardening, creating your own vegetable patch is more likely to be a job well done if you put the proper amount of planning in first. You can’t simply expect to start sowing seeds about anywhere and expect them to grow exactly how you would like them to. Map out your garden and work out how much space you are going to need. You don’t necessarily need a huge amount of space to work with, and you could even grow your plants in containers or in a greenhouse if you would like to continue throughout the wintertime as well. You should start off by marking out exactly where your vegetable garden should go. You should be looking for a spot which allows the plants to get a decent amount of sunshine while still providing them with some shelter from the elements. Fencing panels and hedges are both effective ast doing the job. Most of the plants that you will be dealing with are annuals which grow very rapidly and will need as much sunlight as they can get. You may have to give up your favourite sunbathing spot over to them! You may also want to think logistically. Your vegetables are going to need plenty of water to grow properly, so you could try to position the patch nearby to the water source. Good quality soil is another essential factor which is involved in creating a vegetable garden which flourishes. There is no point growing vegetables if you don’t enjoy eating them! So, think about which varieties are going to be the most enjoyable to you. Of course, you are also better off starting small as there is no point in trying to overwhelm yourself and risk failing because your attention is too divided. Tomatoes, peppers and squash are three examples of vegetables which keep providing throughout the season, whereas others like carrots, radishes and corn only produce once. Both perennial and annual weeds can be extremely damaging to the growth of your vegetables, so you need to make sure that you take the time to clear the crowd effectively. You need to dig over the soil beforehand as you want to get rid of the roots of the weeds to ensure that they don’t grow back and choke the life out of your vegetables. It is important that you are meticulous in this preparation work, as just a few weeds that get away can end up signalling the death knell for your vegetable garden and this can be extremely disheartening. Checking that the soil is up to scratch is another vital part of growing your garden successfully. A simple soil test involves soaking it for a day before digging up a handful. Squeeze the soil over the sink. If water drains out, it may be a good idea to add some compost and other organic matter to the area. Next, open your hand. If the soil has not formed a ball or it looks like it may fall apart at the slightest touch, it is likely that it is too sandy. You have a couple of different options when it comes to planning how your vegetable garden is going to be laid out. 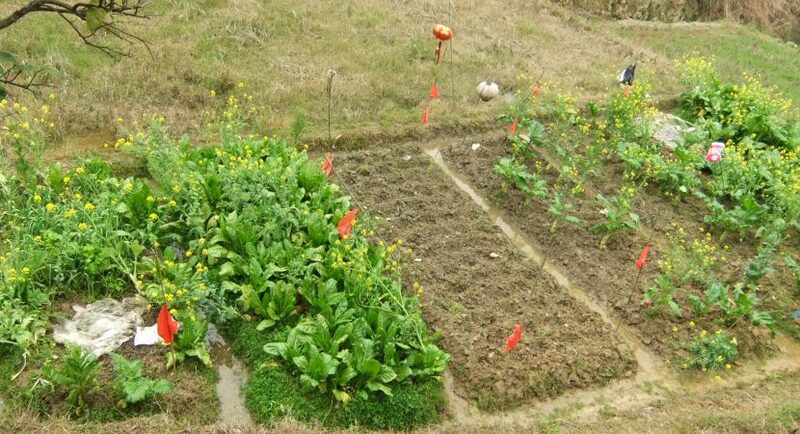 The most common and obvious strategy that people use is row cropping which involves planting the vegetables in clear lines while marking pathways in between them. This is a strategy which works best when you have a large vegetable garden to work with. You need to allow a distance of at least 18 inches between rows so that you can walk between them comfortably. Otherwise, when you don’t have so much space to work with, you can group your plants together in bands in a method known as intensive cropping which will reduce the amount of area needed for paths. The downside of this approach is that you have to weed by hand. Once you have determined that the soil is in good condition and you have planned the layout, the time has come to dig out the raised bed. Start by loosening the soil either using a tiller or by hand depending on whether you have one available or not. Work your compost into the soil and avoid walking over the area as much as possible as this is only going to end up undoing a lot of your hard work. Once you are finished, smooth out the area with a rake and water it thoroughly. Test the soil with a thermometer to ensure that it is at the appropriate temperature to grow the types of vegetables that you are planning. So, there we have the first few steps involved in planning your very own vegetable garden. Obviously, we have not even scratched the surface when it comes to care, harvesting and pest prevention, but making sure that you get the basics right first will go such a long way towards creating a vegetable garden which will provide you with both joy and sustenance.